The Laureus Sport for Good Foundation South Africa announced that it has started funding three new community based projects, namely Boxgirls, United through Sport and AMANDLA Edufootball. With the addition of these three new projects, the Foundation is now supporting 18 projects across South Africa with many of the existing projects having a multitude of sites that implement their sport for good programmes, ultimately impacting a total of 70 communities across the country. The Foundation will also now fund the new Grassroots Soccer site in Alexandra, Johannesburg, which has over 400 active students enrolled in the programme, an extension of their current partnership with Grassroots Soccer in Khayalitsha. “We are really excited and honoured to be in partnership with these projects, they are doing some remarkable work in their respective communities. We would like to thank each of them for their continued hard work and dedication, as well as welcome them to the Laureus family” said Brett Graham, Executive Director, Laureus Sport for Good Foundation South Africa. “We have set a number of key short and long term goals as an organisation, one being to reach more kids across South Africa, and this expansion is definitely a step in the right direction. We are witnessing a significant shift, with many sustainable social change projects emerging, focusing on a variety of different sporting disciplines, whilst addressing key social issues. These are exciting times, as we are seeing first-hand how the model of using sport to inspire our youth, and effect positive change is gaining more momentum in our communities. We will continue to do our best not only in terms of funding, but also to provide our projects with the necessary tools to equip themselves effectively.”, concludes Graham. Boxgirls: For the last 7 years Boxgirls South Africa has been working with primary schools to bring self-defence and leadership training to girls and young women in disadvantaged communities. Founded in 2009 as an initiative of local volunteers, they have registered as a Non Profit Company and launched its Girls’ Leadership Education Programme in 5 primary schools located in the urban townships of Khayelitsha just outside Cape Town. Today there are 20 primary schools in Khayelitsha that are part of the Boxgirls community. Their mission is to help girls and young women in socially disadvantaged urban areas of South Africa to develop strong personal skills, create a supporting social network and improve their academic skills so they can broaden their current and future opportunities. United through Sport: United Through Sport is a South African registered non-profit organisation focussed on using sport as a tool to develop children and youth from disadvantaged communities across Nelson Mandela Bay. The project focuses on the following sporting codes: Football, Rugby, Cricket, Netball, Hockey, Tennis, Basketball and Swimming. Currently the programme reaches over 18 000 disadvantaged and vulnerable youth with direct sports coaching and life-skills programmes, each of these children completing the 18 hour United Through Sport curriculum. Their educational programmes are currently yielding 87% average improvements in English scores and 83% average improvements in maths scores. They have 63 children on full 5 year high school scholarships at top level schools around Nelson Mandela Bay and so far have a 100% University placement rate for their Senior School of Excellence Programme. Amandla Edufootball: AMANDLA uses the power of football combined with holistic education to empower young people and to change lives. As a catalyst, AMANDLA Safe-Hubs serve as safe, educational, youth friendly centres in communities characterised by poverty, unemployment and inequality. They currently operate in Diepsloot, Khayelitsha and Gugulethu. Since the project begun, youth participation in AMANDLA activities has increased by 92%. With the aim of continually improving its reach and impact, AMANDLA monitors and evaluates all activities on a regular and ongoing basis. Currently, over 3,000 young people benefit on a weekly basis from AMANDLA Programmes. Additionally, countless young people in the immediate vicinity have come into contact with the programme through educational activities and positive role models. The continual increase in participation proves and strengthens the attraction and relevance of the AMANDLA Programme for young people. 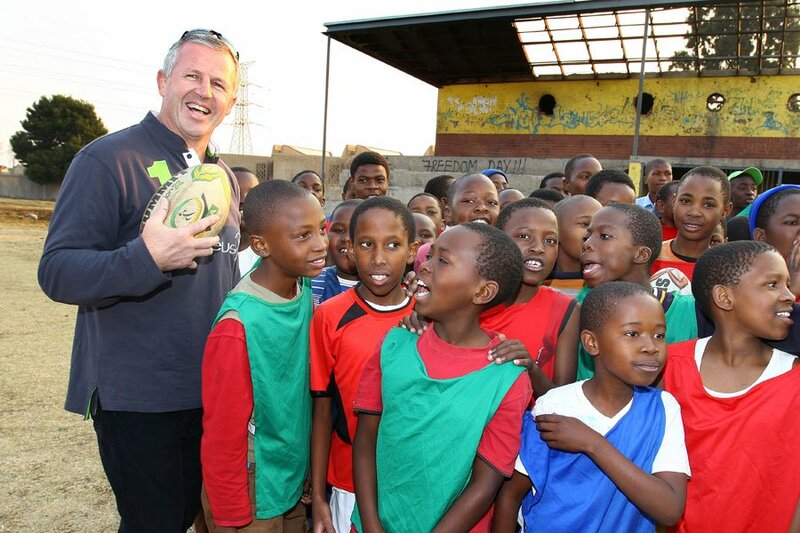 The Laureus Sport for Good Foundation currently funds 18 different social change projects across South Africa. The Foundation’s overarching goal is to use sport as a tool for social change, to help young people overcome the limitations imposed by challenging social issues including poverty, homelessness, war, violence, drug abuse, discrimination and AIDS. Good day Where can you apply to get sponsorship? Ntwane Real Madrid FC humbly appeals and ask that you may consider our donation request. The mission of NRMA FC – is to promote the standard of sports at vulnerable communities. – to promote good sportsmanship, physical and mental development through sports exercises. – Soccer Attire for junior team we are failing yo reach our target and other thing is that we’re failing to play under our LFA due to the crisis we’re facing as a team. Age category: Junior team (Boys, under 17 boys). Good day, my name is Vusumzi Johnson Booi. I am a South African and am 38 years old, I have established an NPO that has a vision to empower poor households especially toddlers/teenagers. The programs of the organization (Masijonganeni Sakhane Bahlali 173 – 177 NPO) will emphasize on development of young minds beginning on the early age, I (Vusumzi Johnson Booi/Chairperson) trust that this information is found to be in order and appeal to you (and the entity) to grant our organization (Masijonganeni Sakhane Bahlali 173 – 177 NPO) an opportunity to send through our proposal for funding. I thank you. We have been supporting and building partnerships with community sport and development projects across Africa and elsewhere in the world for over ten years. Christian Centre Remar is an NPO which takes in abused women and children, the elderly, the destitute, drug addicts and alcoholics. We house over 90 men, women and children, over a long-term period, at no cost to them. We have a Kia 2.7 used for collecting donations and deliveries. This is our only source of income, and has broken down. We are in urgent need of a new engine and appeal to your organisation for assistance. Your assistance would be most appreciated, as we rely solely on such donations and sponsorships. Please see attachment for information on our centre. Please provide me with more info. about your funding. I would like to apply for funding please provide me with more details on how to go about. My name is Monique van der Merwe, my son belongs to a local soccer club known as Rangers FC, located in Gelvandale in the Northern Areas. This team has been struggling for years to get funding for equipment and apparel for the players and help to upgrade their soccer field and facilities. The municipality has been approached a few times regarding the state of the field, but our pleas have fallen on deaf ears. Our vision and main aim is to become an inspiration for all in the community and provide a positive and instructive environment to the youth within the Gelvandale area and also to promote a healthy and an active lifestyle. Because the kids in the club come from different walks of life, they cannot always afford club and referee fees and even decent boots to play in. The coaches and some of the parents have been supporting these kids and even buying equipment and apparel out of their own pockets, which is quite taxing on their pockets. We have not always asked for hand-outs, but due to the lack of funding, we have tried to remedy the situation ourselves by hosting various fundraising events, which have been poorly supported due to the area the club is situated in and the parents not being able to support as well. Unfortunately, as your know in any sport, incl. soccer, it become expensive and not all families can afford the costs and because unemployment plays a big role, the kids and the club are not able to afford the basics. Therefore, we are approaching local businesses or organizations to sponsor our team with equipment and apparel for our players. What we would need are the following listed below and if you are able to assist with any of these items, please indicate by responding to this mail. Sponsoring this team would be a great way to get involved with the northern area community and even though I understand that you might have different community outreach opportunities, I truly believe that your organization would make a big difference in the lives of the kids and bring relief to the both the parents and coaches. We are open to your ideas regarding the sponsorship. If you have any questions, please contact me via my e-mail address. Thanks for your message. Kindly complete the Expression of Interest Form on our website which will confirm if your organisation meets our funding criteria. My name is Mduduzi Mthembu. On behalf of Nongoma Local Football Association (179-725 NPO)as chairperson I hereby appeal request your organization to consider helping us football equipment. As football association our aim train, develop and promote playing of football amongst our youth. We are situated in deep rural area with underprivileged community. This is a good cause which also help to keep our youth engaged in sports and avoid involvement in social ills. We are looking for football equipment such as soccer jerseys, soccer balls, bibs, cone/markers, soccer boots. These are basic items which are essential for football development. 571) we are reaching out directly to you in terms of funding and non-funded towards our soccer development with social challenges in the Pretoria West areas. Should you be in a position to donate any goods as per attach (any kind of donation will be appreciated) towards our club or help with any fund raising events, you will be given the opportunity to advertise your business at the event or even during our sports season. Our club testimonial, NPO certificate and club account details will be submitted on request. Once again thank you and we hope you will consider contributing and hope it will materialise in the near future which will surely stable our relationship for many and many more years to come. Thank you, Amen Praise The Lord. We are also on the Facebook you can check out our page and clips on Radical extreme sports and 3square skate park. I’ve also attached a few documents regarding our Npo and our daily program structure. could you kindly please advise or help us. Dear Tshepo, thanks so much for your message and the great work being done. Please refer to the Expression of Interest form on our website, which will outline where assistance is given by Laureus and the criteria to be met. Dear Confidence, thanks for your message and thanks for the work you are doing in your community. Please see our Expression of Interest form, which will outline funding requirements. Regards, The Laureus SA Team.